The island archipelago of Guadeloupe offers an evocative blend of natural beauty and rich Creole and French culture. The archipelago is an overseas region of France, and its food, language, and culture reflect this tie. Guadeloupe proper resembles a butterfly in shape with two main islands, Grande-Terre in the east and Basse-Terre in the west, separated by a narrow mangrove channel called the Rivière Salée. Palm-fringed beaches rim the coastline, and the interior is lush and mountainous with waterfalls, hot springs, and an active volcano. Most tourist facilities are located on the southern shore of Grande-Terre, which is also home to the largest city and cruise port, Pointe-a-Pitre. The archipelago also encompasses the smaller islands of La Desirade, Les Saintes, and Marie-Galante, which offer many natural attractions of their own. All of Guadeloupe’s islands boast excellent opportunities for birding; photography; hiking; and water sports such as snorkeling, swimming, and diving. Guadeloupe also hosts many colorful carnivals and festivals, including the five-day Mardi-Gras Carnival ending on Ash Wednesday. Designated a World Biosphere Reserve by UNESCO, Guadeloupe National Park (Parc National de la Guadeloupe) on Basse-Terre Island, often draws more than one million visitors per year. 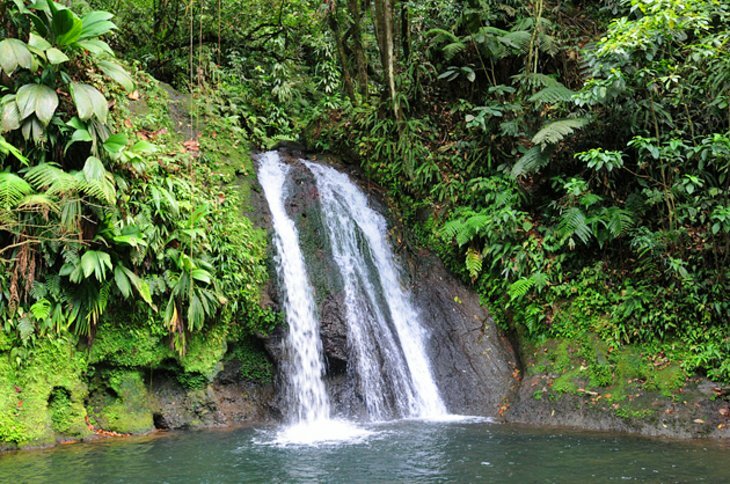 The park encompasses 300 kilometers of hiking trails; La Soufrière volcano at 1,467 meters; Col de la Matéliane at 1,298 meters; and a wide range of flora and fauna, including 100 species of orchids and 11 species of bats. Birdwatchers will enjoy the diversity here with resident species such as the black woodpecker, pearly-eyed thrasher, and Lesser Antillean pewee. A good way to tour the park is via Route de la Traversée (D23). This scenic trans-coastal highway winds through the tropical forest of majestic mahogany trees and bamboo. Along this route are lookouts, picnic areas, jungle waterfalls, and a staffed roadside center at Maison de la Forêt. You can also stop for a cooling swim at Cascade aux Ecrevisses, a small waterfall spilling into a pond. Other popular things to do in the park include the hike up the volcano and another trail to a series of waterfalls on the lower slopes of the volcano, known as Les Chutes du Carbet (CarbetFalls).